Ready for a savory sushi roll? 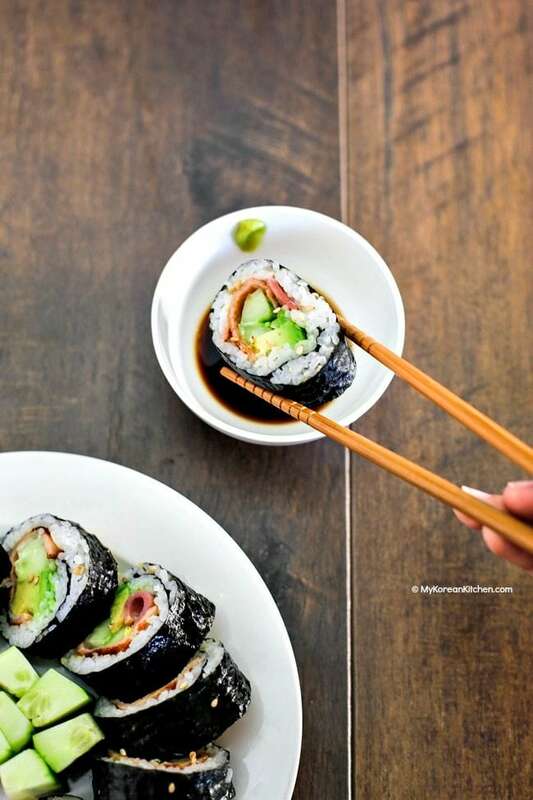 Try these bacon avocado cucumber sushi rolls! It’s super delicious! 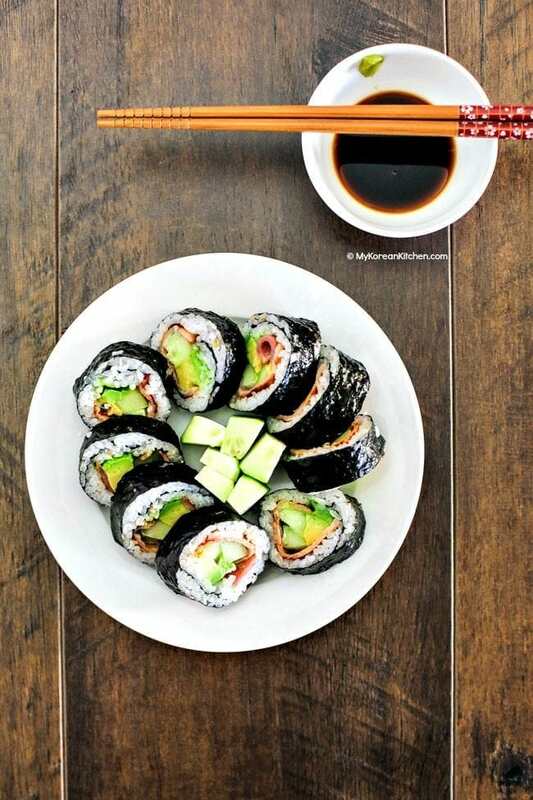 The other day I had a huge craving for Kimbap / Gimbap (김밥, Korean rice rolls) but I didn’t have any Kimbap ingredients in my fridge, so I decided to make with what I had – these bacon avocado cucumber sushi rolls! In a way, I’m glad that I didn’t have all that Korean ingredients because I discovered our family’s new favourite! My daughter for one, she’s a sushi killer! She’s loved sushi rolls since she was able to have solid food. Every time we ask her what she wants for her lunch during our shopping at the mall, she says sushi rolls! You get the picture right? And my husband and I love these rolls too. All the ingredients are available at a local (non-Asian) grocery store. That saves my return trip – 1 hour – to my closest Korean grocery store. 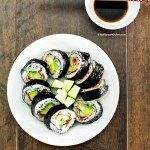 It’s very delicious and more straightforward to make than a traditional Kimbap as this uses less ingredients. Its savory and refreshing at the same time. Mayonnaise is quite important making these sushi rolls savory, so I hope you don’t skip it! The crunchy texture from the sesame seeds and cucumber is quite irresistible! It goes well in a lunchbox even though it has bacon in it. This is a definitely a big bonus point as my hubby carries a lunchbox to work. If we’re having it the next day, we just leave it out at room temperature 30 mins to 1 hour before consumption to soften up the rice. We don’t microwave this as the seaweed can get soggy. I hope these are good enough reasons to make for you as well! Enjoy! 1. In a large bowl, mix the cooked sushi rice with the sushi seasoning and roasted sesame seeds. Set aside while other ingredients are being prepared as mentioned in the ingredients section. 3. Place the prepared ingredients on top of the rice (in the lower centre of the rice) in the order of bacon, mayonnaise (3 to 4 rows), avocado and cucumber strips. (I used 2 short cut bacon, 2 avocado strips and 2 cucumber strips per one sushi rolls). 4. Once all the ingredients are set, lift the bottom end of the sushi mat to cover the ingredients. Once you cover them, roll up the seaweed to the top. 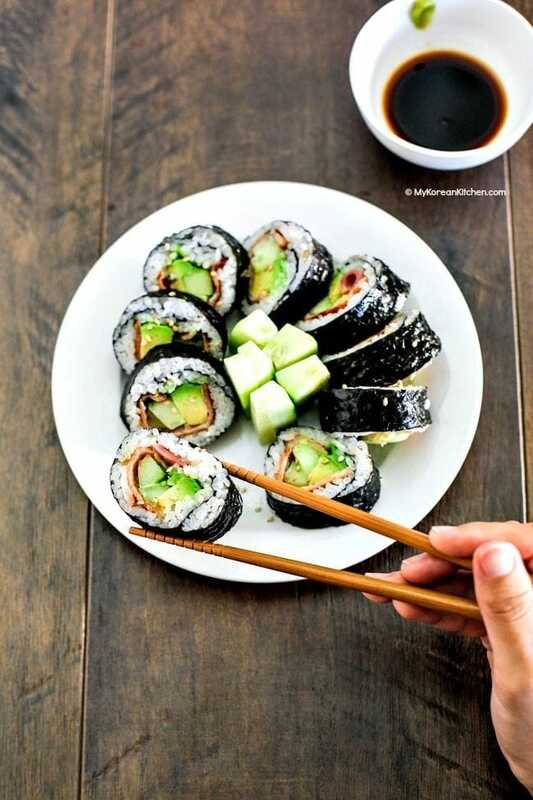 (Paste some water or put some rice pieces at the edge of the seaweed sheet, if it doesn’t stick) Roll the sushi roll with the bamboo mat once more to give a firm shape. Repeat this process with the remaining ingredients. 5. (Optionally brush the sesame oil on the outer layer of seaweed.) Cut the sushi roll into bite-size pieces. Alternatively, halve the roll and eat like a burrito. Serve with a dab of wasabi sauce and a dash of soy sauce. 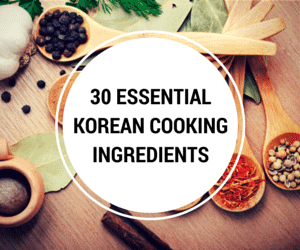 For general guidance on cooking Korean steamed rice (short grain rice), check my “How to cook perfect Korean steamed rice” post. For my rice, I used the “sushi rice setting” from my rice cooker. 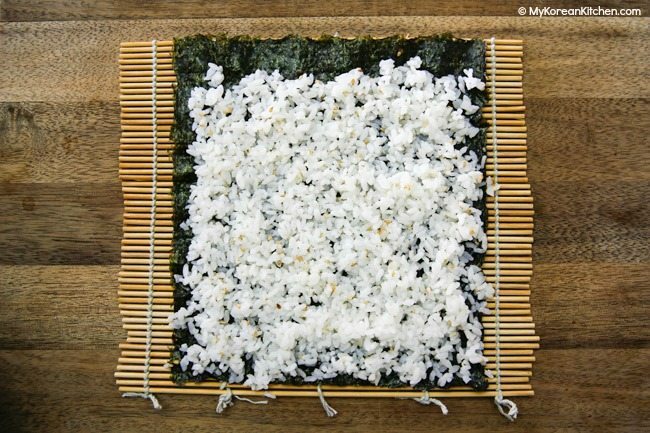 Sushi rice is slightly drier than typical Korean steamed rice. 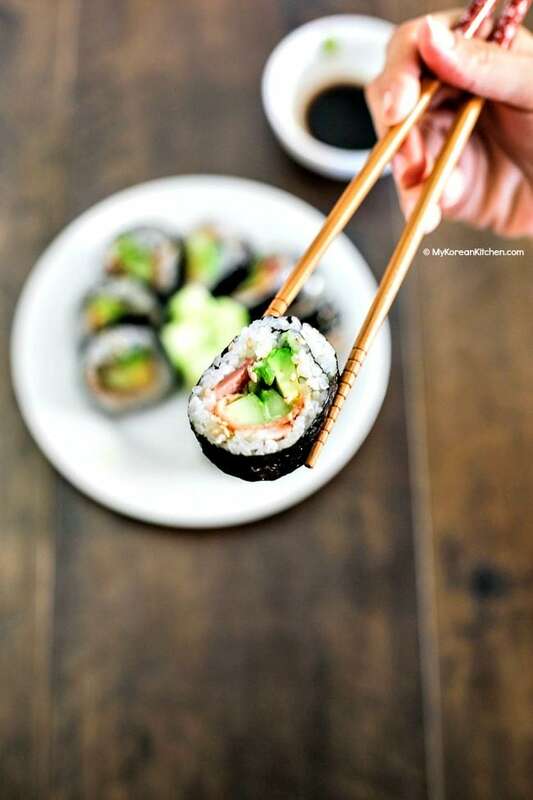 If you like sushi rolls, you might also like my other Korean rice roll recipes. 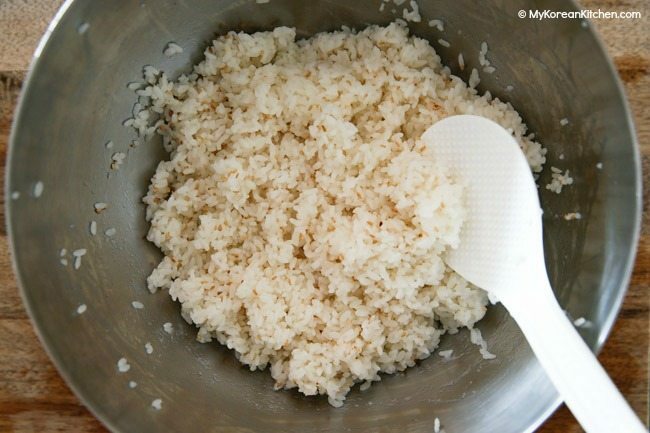 In a large bowl, mix the cooked sushi rice with the sushi seasoning and roasted sesame seeds. Set aside while other ingredients are being prepared as mentioned in the ingredients section. 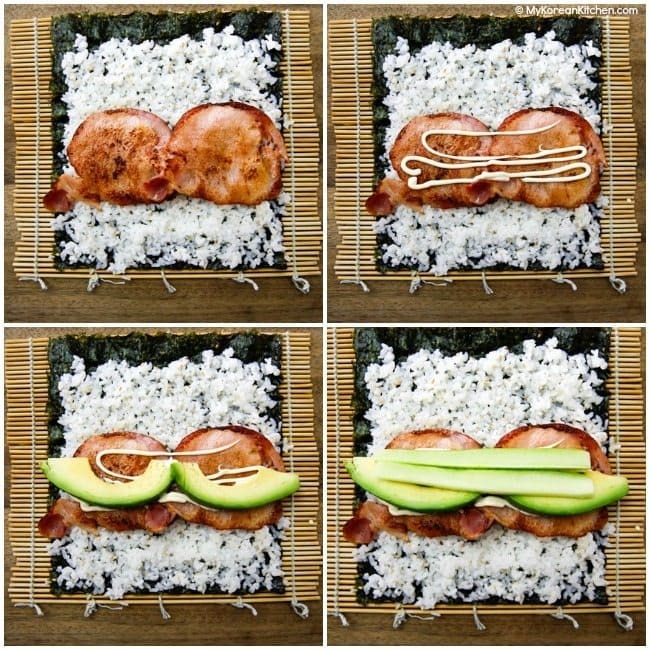 Place the prepared ingredients on top of the rice (in the lower centre of the rice) in the order of bacon, mayonnaise (3 to 4 rows), avocado and cucumber strips. (I used 2 short cut bacon, 2 avocado strips and 2 cucumber strips per one sushi rolls). Once all the ingredients are set, lift the bottom end of the sushi mat to cover the ingredients. Once you cover them, roll up the seaweed to the top. 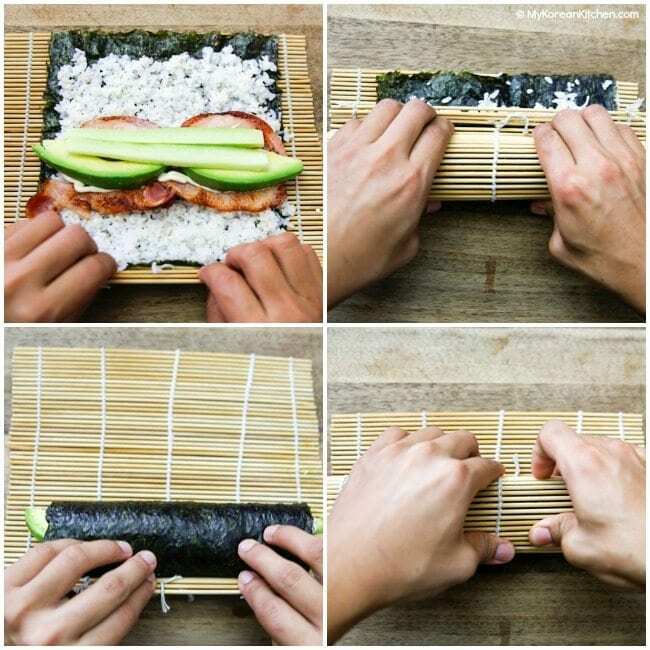 (Paste some water or put some rice pieces at the edge of the seaweed sheet, if it doesn’t stick) Roll the sushi roll with the bamboo mat once more to give a firm shape. Repeat this process with the remaining ingredients. (Optionally brush the sesame oil on the outer layer of seaweed.) Cut the sushi roll into bite size pieces. Alternatively, halve the roll and eat like a burrito. Serve with a dab of wasabi sauce and a dash of soy sauce. 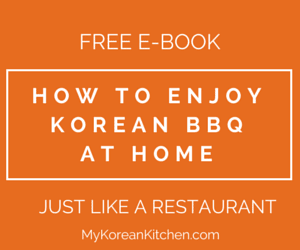 I stumbled upon your page yesterday looking for a bibimbap recipe. I have been enjoying reading over your recipes and cannot wait to try them! I made these rolls today! So good! I think I’ll also try them with a little tomato next time as a blt roll. I think they’d be perfect as a party app! Hi Loni, Thanks for checking out this recipe! 🙂 I hope you enjoy these rolls and let us know how your BLT roll goes! I read your post Friday before going to lunch; I made this as a deconstructed salad with out the meat (didn’t have any on hand in the fridge & substituted the prepared hijicki I had in the fridge, with leftover steamed rice. I was delish. I used to do these with tomato, the BLT sushi roll. Such a great snack!! Wow, never thought of using tomato in a sushi roll. Sounds interesting and I might give it a try next time! Thanks, Keith! Too kind! ? When we first moved to the U.S., we had shipped the rice and nori with our household goods but we did not have the fish cake, etc. available in southern Oregon. My Mom often used bacon in her rolls, too. Eventually, we were able to find a Japanese store in Portland that would ship the goods by Greyhound. I still make bacon maki to remind me of her. You must read minds! My oldest came home from college craving Korean sushi rolls. Your bacon cucumber avocado roll to the rescue! Thank you for keeping families’ busy schedules in mind when sharing recipes. I hope you and your son enjoyed sushi rolls today! Hi Nolan, Are you sure you got an email from me about not opening my emails? I don’t think I did. 🙂 If you can forward that email to me that would be great. I will investigate what’s going on. 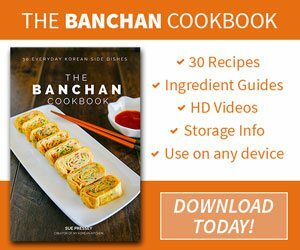 Also thanks for checking out my recipes every time and trying them out! I love french cheese & wine. Definitely my kind of living as well. ?